On Friday of this week, we attended a conference at the International Center of Bethlehem, the conference center of Christmas Lutheran Church where Mitri Raheb is the pastor. We have come to expect when Mitri is behind a project, it will be a first-class operation, it will increase our understanding, and we will leave feeling better for the experience. The conference title printed above from the header of the conference program notes that the focus was on the Christian presence here in the Holy Land. A conference like this could have easily been titled "Christian Absence" focusing on the dwindling Christian presence and the phenomenon of Christian emigration. The oft-quoted figure is that Christians here number less than 2 % of the population, and many of us have reflected on what Jerusalem and Bethlehem would be like if the day came when there are no Christians left and the churches became museums of the past? What would this mean for us individually? What would this mean for the global church? Yet the conference was not aimed at us. It was aimed at Palestinian Christians to reflect on the challenges and opportunites that confront them. The language of the conference was Arabic with tranlsation provided for the handful of us expatriates who attended. 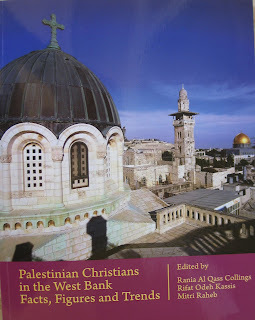 The several hundred attendees included religious leaders, but also sociologists, historians, and educators from the Arab speaking Christian community living in Israel, as well as the West Bank. Half of the attendees were youth--after all it is their future that is at stake. The terms challenges and opportunities are significant. For decades we have been talking about the problem of Christian emigration and have been using statistics to demonstrate it. 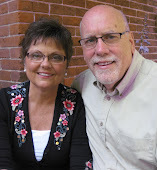 The CBS News 60 Minutes program on the plight of Christians last April is an example that makes us sit up and take notice. Palestinian Christians in the West Bank: Facts, Figures, and Trends, by Mitri Raheb, Rafit Odeh Kasis, and Rania al Qass Collings, is an updated and expanded edition of a 2008 study also published in book form by Diyar and available online in a pdf. file that can be accessed here. Their concern was more that just the statistics, but the questions of Why? and What are we going to do about it? In the preface he wrote that the purpose of the study was so that "Christianity will survive and thrive." Recently, there has been a lot of misrepresentation of the facts and misuse of statistics regarding Christian emigration from the Holy Land--especially having surfaced in this year's American presidential election campaign and in an Op-Ed published in the March 9 Wall Street Journal by the Israeli Ambassador to the U.S. 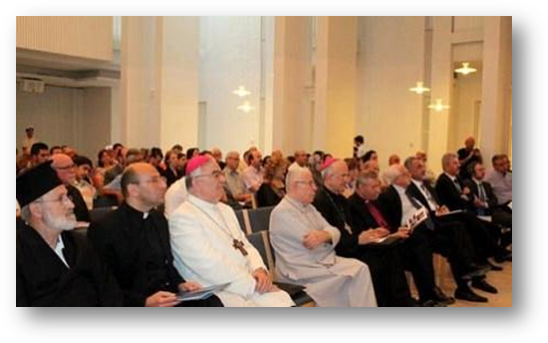 The result was a strong campaign of letters to the editor by American Church leaders and also by Palestinian Christians. Among the responses was one by Pastor Raheb. Yet his approach is also one of providing the information needed to present interpretations clearly and factually. This book will be an important resource in that regard. Churches, like the ELCJHL, have responded with strategies to provide affordable housing--such as the proposed Mount of Olives Housing Project--vocational training, and leadership development. For those of us in the West, one of the surprises is that only a very few (less than one per cent) listed "religious extremism" as a factor in their decision to emigrate. Studies like these have been available for some time, yet there are many who are convinced that Christians are being driven out by Muslims. A current top-ten New York Times Book in fiction describes an imaginary scene of a papal visit to the Holy Land with the Pope delivering a speech in Bethlehem scolding the Muslims as responsible for the demise of Christians in Bethlehem. Similar ideas are also spread by popular evangelical preachers who frequently make pilgrimage to the Holy Land, yet never speak to the local Christians. The same was argued in the Wall Street Journal piece. Arab Christians in Israel: Facts, Figures and Trends was written by Dr. Johnny Mansour, A Christian from Ibillin in the Galilee and a Professor of History at Haifa University, to present the same kind of accurate and complete information about the 151,000 Christians who are Israeli citizens. 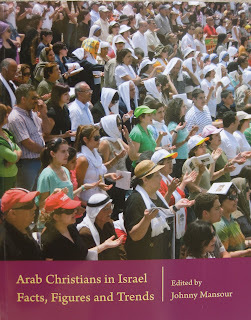 The focus is on Arab Christians, but with the realization that the numbers of Christians in Israel also include Messianic Jews, migrant workers from places like the Philippines and Thailand, Ethiopians, and 20,000 Russian Orthodox Christians who immigrated to Israel in the late 1990s as part of the massive immigration of Russian Jews. Charts and graphs showing the high level of education by Arab Christians, yet also high unemployment rates, low acceptance into Israeli univeristies, and similar difficulties, support the common description of Arab Israelis as second-class citizens. 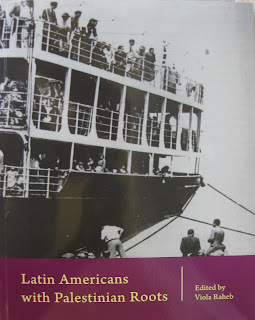 A third book presents another side to emigration--the Christian Palestinian emigration for economic reasons to Latin America at the beginning of the 20th century. 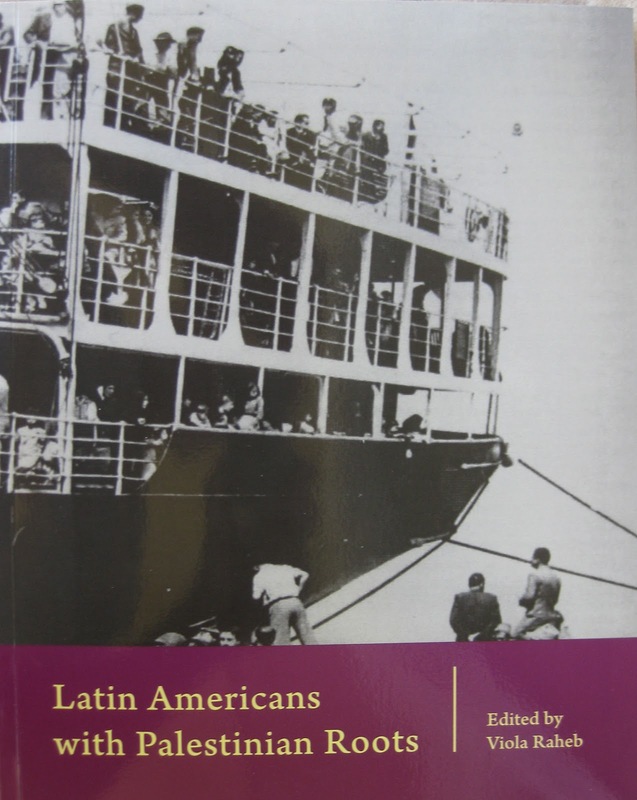 Violet Raheb has edited Latin Americans with Palestinian Roots compiling a series of new studies by several Palestinian historians and several Latin Americans who reflect on their families' experiences. Most Iowans are aware of the large immigration to Cedar Rapids from Lebanon and Syria. Many Christians merchants from Bethlehem brought olive wood and mother-of-pearl wares to the St. Louis World's Fair in 1904, receiving business invitations to the U.S.A., Mexico, Guatemala and other countries. Descendants of these early Christian immigrants (most from Bethlehem region) to Latin America now number over half a million. The highest number of Palestinians are found in Chile. The highest percentage are found in Honduras. Several presidents of Honduras and El Salvador have been Palestinian. By 1930, twenty of 58 clothing factories were owned by Palestinians. 77 % of the immirgrants to Chile were male, 40% were under the age of 20. Again the reason for emigration was economic with many young men sending back funds to help their families back home. Others returned to their homeland after a time--the greatest number after World War I and the dissolution of the Ottoman Empire. One of the interesting findings is the role of emigration and repatriation in the self understanding of Palestinian identity, especially as Britian officially recognized Palestinian citizenship for those who left under Ottoman passport according to the stipulations of the Treaty of Lausanne. 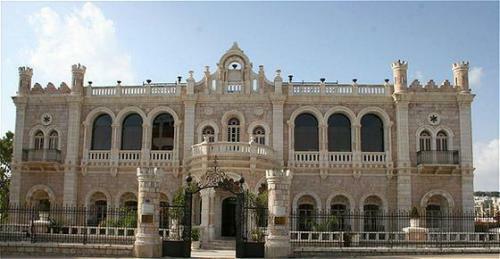 That early emigration influenced Palestinian architecture with Bethlehem's Jacir Palace, built by Suleiman Jacir in 1910, and now incorporated into the Intercontinental Hotel.